From Middle English fox-tail, equivalent to fox +‎ tail. A plant having a part resembling the tail of a fox or such spikelet. Look at the foxtails growing along the road. species of genus Alopecurus, foxtail grasses. 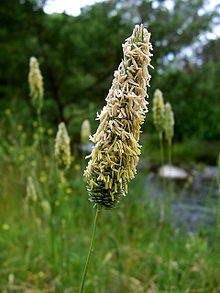 species of Setaria, foxtail millets. Lycopodium clavatum and Lycopodiella alopecuroides, foxtail clubmosses. (metallurgy) The last cinders obtained in the fining process.